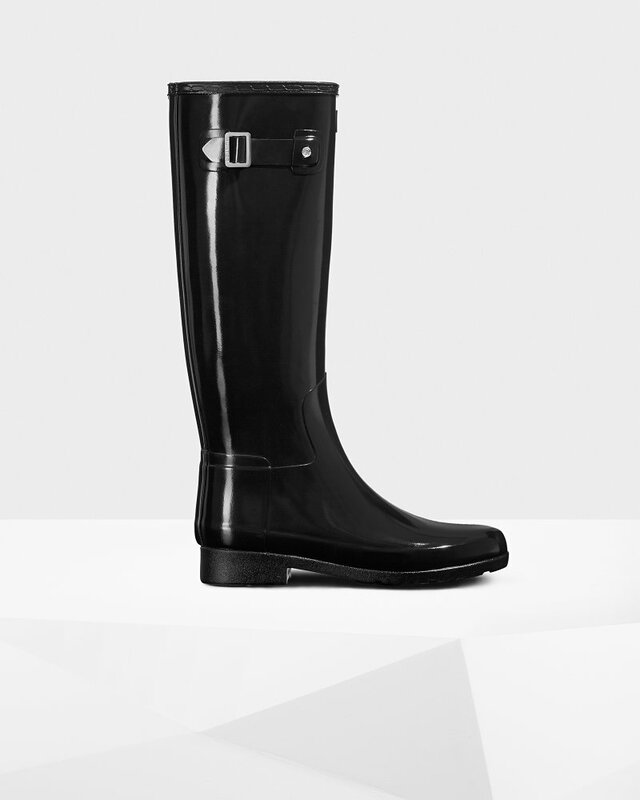 Women's Refined Slim Fit Tall Gloss Rain Boots is rated 4.4 out of 5 by 22. Version encore plus ajustée, idéale pour la vie urbaine, la botte haute Wellington raffinée est taillée sur mesure pour une coupe plus cintrée et comporte moins de couches de caoutchouc naturel, assurant ainsi une sensation de légèreté accrue. Fabriquée à la main et entièrement imperméable, cette Wellington pour femme au fini brillant allie fonctionnalité et style, pour une allure chic par temps de pluie. Rated 2 out of 5 by ChristineNDee from Great until they ripped I have always been a big fan of the Hunter rain boots and have been a returning customer. I loved my previous boots, they were a wonderful investment and lasted almost 8 years. My most recent pair were purchased less than 18 months ago and have a rip on the top of the foot. This rip has pretty much made the boot useless because my foot cannot be submerged under water. I’ve called customer service and have been told that there was nothing they could do about the situation because I did not keep my proof of purchase. I did not think I needed to hold on to my receipt as I had such a great experience with my previous pair. As much as I loved boots I don’t know that I could justify paying a premium cost for a less than premium product. I’ve attached photos of my boots which look brand new with the exception of the rip. Rated 5 out of 5 by Reesie from Cute, Comfortable I really like the slim fit of these boots, but it is a seriously SLIM fit. I have skinny chicken legs and these are snug. But I really like the way they look and they are comfortable to splash around in for a long time. Thanks! Rated 5 out of 5 by Westcoaststyle from Attractive & practical I live in the PNW, so rain boots are a must, but need to look professional. In particular, I wanted boots that would look good with my Burberry trench. These navy boots are perfect! Rated 5 out of 5 by Darshika from Great Rain Boots I really wanted to buy a pair on rain boots from Hunter and I finally did. These boots are really cool and I really got them at a great discount from Hunter. The boots are cozy and will keep you warn during a rough rainy day. Rated 4 out of 5 by smh28 from Beautiful elegant boot I have had these boots for several weeks now. I love the look of them. They are sleek and streamlined and a bit more elegant than the regular ones. I am short and petite and they do come right up under my knees but so far I have not found that uncomfortable. As I said, I am a petite person. I am about 5’3” and 115 lbs. I would consider myself to have narrow feet and calves. I do find that these boots fit quite snuggly around my feet and around my calves. I am a size six and length wise they are perfect but circumference wise I cannot wear thick socks and it is a struggle to use the Hunter boot socks I bought because they are so narrow in the shaft. So bottom line I love these boots but I would probably try a size up if I buy another pair. Just to have room for thicker socks. Rated 4 out of 5 by Ines94 from Good but ankle area huts I love the slim fit about these boots. They are warm and classy! However, I find the heel area very uncomfortable when walking... I didn't have this problem with my older Hunter pair (original). In terms of the fit, I am usually a size US 7 but had to size up with the slim fit.